Immediately after his high-profile move away from Real Madrid, Ronaldo was finding it hard to find the net in the Serie A. It took the Portuguese forward three matches to get back to his goal-scoring form. He has now netted seven goals for Juventus in all competitions so far this season. The five-time Ballon d'Or winner has since also taken on free-kick duties at the Old Lady. Teammates Paulo Dybala and Miralem Pjanic who were designated free-kick takers in the team were aware that things were about to change with Ronaldo's arrival. Speaking to Gazzetta dello Sport (via The Express UK), the Argentine joked, "Last year, Mire and I had a pact: if it was towards the left side, he would take it, whereas on the right it would be me. When Ronaldo arrived, I wrote to Pjanic in our chatroom: 'Sorry Mire, but I think you won’t be taking many free-kicks this year'"
He added, "On penalties it’s a clear hierarchy - first Ronaldo, then me, and then Pjanic." Juventus boss Allegri has now spoken about the free-kick situation, stating that his star recruit Ronaldo will no longer take every penalty for the team. Speaking to Calciomercato, the manager said, "Free kicks? Ronaldo is a smart guy, he knows Pjanic and Dybala are very good with free kicks close to the area. When there are free kicks from far away he can kick them but we've decided that Dybala and Pjanic will take set pieces close to the area." While Dybala and Pjanic have been consistent in their free-kick history, scoring a combined 16 free-kicks in the last three Serie A campaigns, Ronaldo's record is not as exceptional. 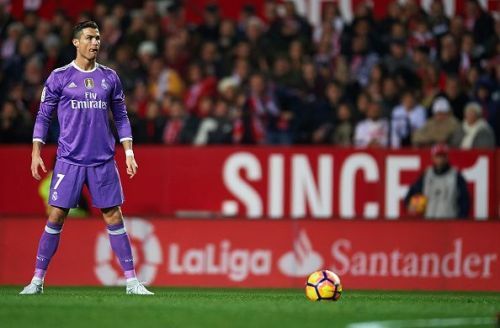 The Portuguese has only scored two free kicks in his last three seasons at Real Madrid. Juventus are set to go head-to-head with Cagliari in the Serie A this weekend.